Werkraum Bregenzerwald is an association of more than 90 local crafts and trade enterprises. Most workshops are small companies with less than 10 employees. Established in 1999, the platform strives to support its members on all levels and to maintain and secure the leading role of the local crafts. What started as a regional initiative now receives international acknowledgement as a model for modern craft professions. In 2013, the association set up its premises in the heart of Andelsbuch, in the newly erected Werkraumhaus by architect Peter Zumthor. The broad sweeping roof follows the line of the road and creates a forecourt at the entrance. The recessed glass facade seems to double as a display window. Seven hundred square metres laid out under a load-bearing wooden grid, high expanses of glass allow outside and inside to blur with one another. A grand gesture of invitation. 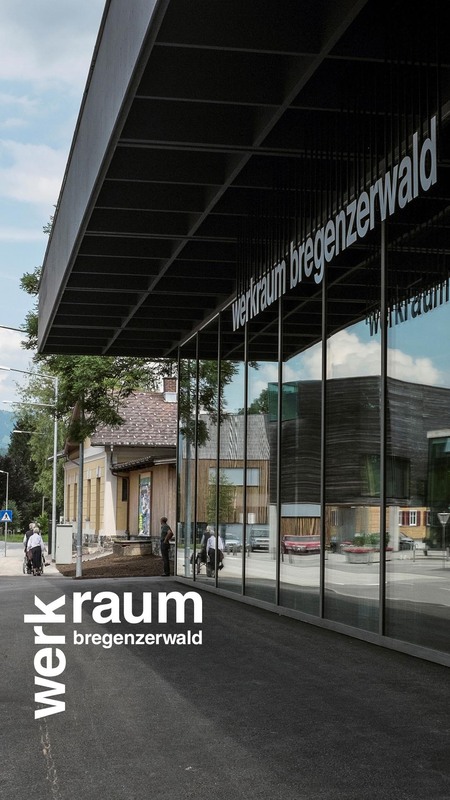 The Werkraumhaus was established as a stage, an exhibition space, and a showcase for the members of the Werkraum Bregenzerwald. The building is thus an expression of the concentration and quality of the regional craftsmanship and, at the same time, a celebratory gesture of the proud sense of the protagonists’ own identity, apparent in the way they make the results of their work public and open for discussion. In the shop you will find products manufactured by regional craftspeople as well as literature on the subjects of craftsmanship and architecture. The Werkraumhaus brings regional craftsmanship and hospitality under one roof. The small restaurant is offering lunch as well as cake and coffee. Regional and seasonal products are used for the daily changing lunch.